same tiny little house in Addis Ababa, Capital city of Ethiopia. The younger sister plays soccer, the older does hair braiding in her cousin’s shop which is attached to street side of the painted stick and mud house. The older of the two writes and asks me to find a “forever” family in the U.S.A for them. She tells others she wants “Poppy” (the name our grandchildren use for me) to adopt them. We are in our seventies. The Ethiopian government only allows photos to be made available to interested parties. Will you help me find a forever family for them? The four wheel drive car turned right off the pavement and began to wend it’s way through people, donkeys and occasionally dogs. Dust swirled around the tires as we began our decent into the valley. Everywhere there are small farm plots being prepared for the rains which (hopefully) soon are to come. We crossed the “river” which is little more than a ditch and drove across the valley. Wheat, teff, peas and beans are the main crops here. They can all be harvested and stored. There is no electricity hence no refrigeration. Finally we arrive at Gurane Village Ethiopia, on one of the many small hills scattered across the valley. At the foot of the hill the ground is level and flat enough for farmers to do their threshing. Animals walk in a circle, their hooves crush the seed heads and separate the grain from the stalk. I am reminded of King David and the threshing floor he bought thousands of years ago. The technology hasn’t changed here. 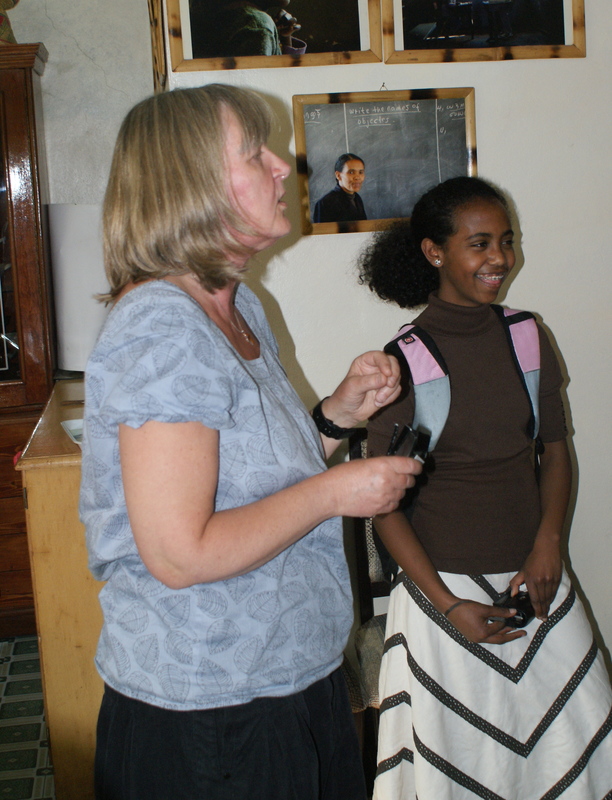 A few months prior Charlie had visited and asked Zerihun, older brother of adopted granddaughter Fetlework: “How can we help?” Three boys and the youngest child, a girl, became orphans years ago when both parents had died. 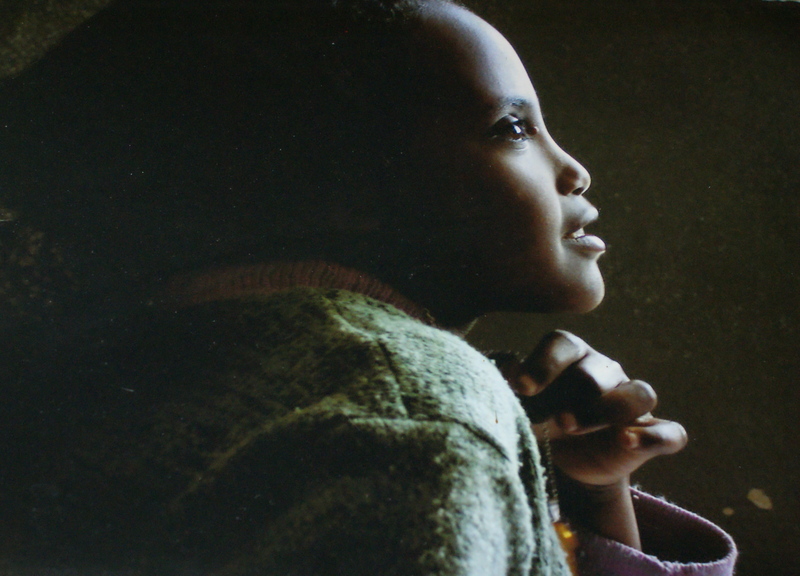 The girl, Fetlweork, was deaf and went to an orphanage and eventually to our family. The boys stayed in the village. Zerihun’s priorities had changed from a year before. Then he wanted “seed” money to open a small shop. Now his responsibilities have grown from himself and a younger brother. He has taken a wife. We had told him “we don’t give money.” Now he would like to rent more land for farming and buy a second ox which means he would no longer need to rent someone else’s. He needed a team for plowing. He may even be able to rent out his team instead. 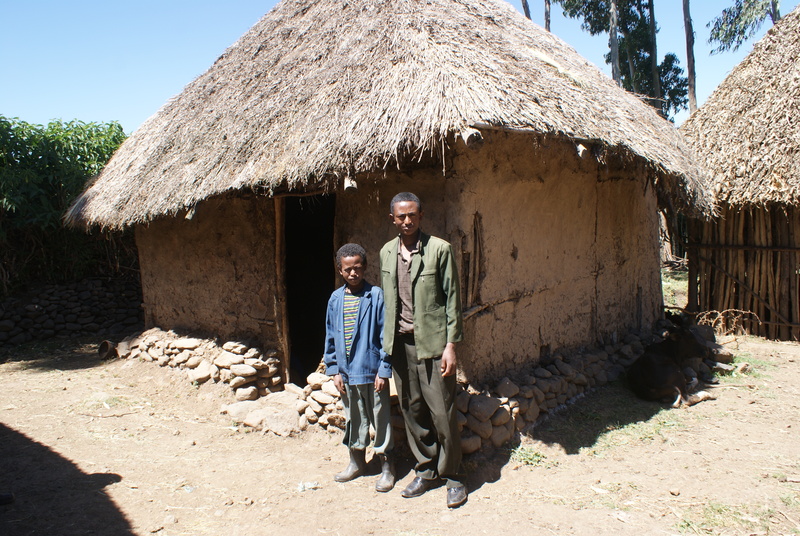 We decided Zerihun is a responsible young man and, contrary to our word, gave him the needed funds with one stipulation: “God has blessed you with this. When your next harvest is complete and you have made a profit you must help someone else.” We shook hands and it was done. Now we have returned for, among other purposes, to see his ox. He was proud as he opened the gate and showed us. It is big, black, healthy and strong looking. He did well. So well, he had purchased the ox for less then market price. There was “Extra” money. Zerihun is not one to waste an opportunity. Their house is made of sticks and mud. The straw roof and walls are deteriorating. It is where they were born. He can gather the needed poles and when the rains come he can make mud but really, a tin roof is better. With the additional funds he purchased the tin. The tin is in the house for safe keeping, leaning against the wall. Now he can take down the old one and build a nice new, dry house for his bride. There are other orphans in Gurane. As we identify them and determine their needs maybe you will help us help them? 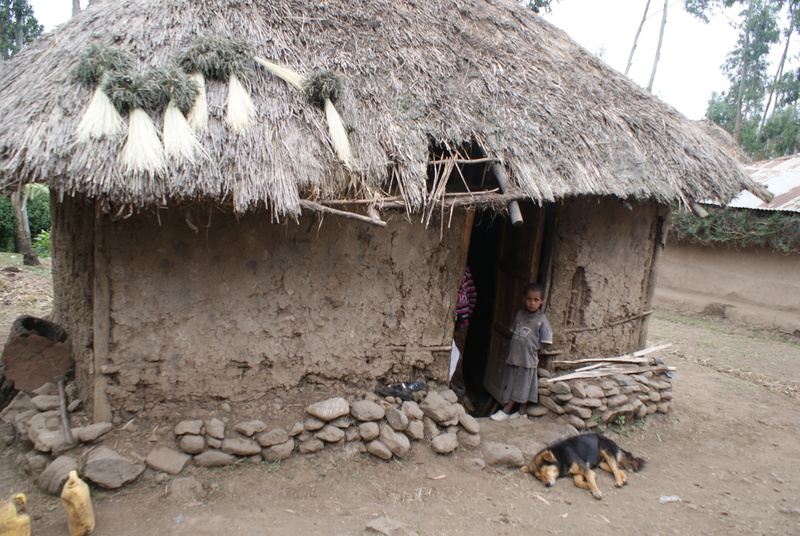 Our no longer orphan Granddaughter was born here in one of the typical mud huts. 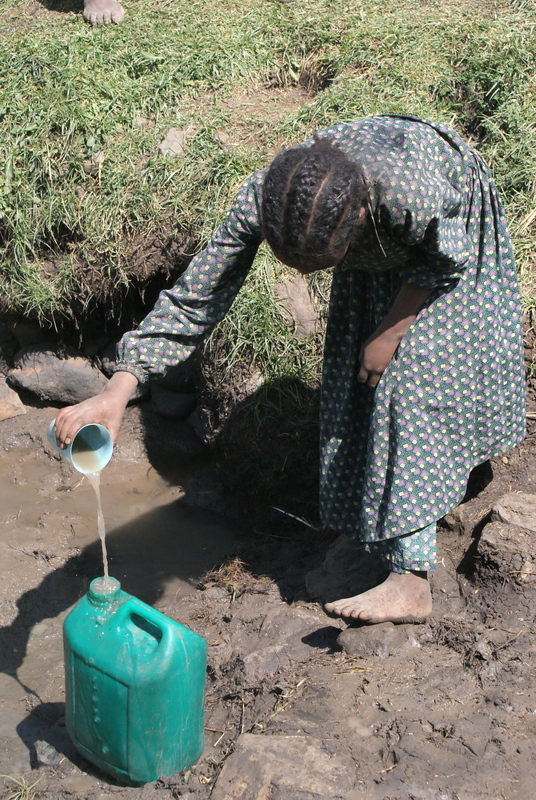 At Gurane Village Ethiopia and surrounding communities water access is…….challenging. The river is too far and the watering hole becomes only a muddy puddle when rain is scarce. Will you help us bring Living water and clean water to Gurane? Living water in the form of an educated, trained pastor who can teach God’s word and help us facilitate construction of a water well and other matters? $1,600 U. S. pays the pastor for two years after which he should be self supporting. $1,500 U. S. will dig the well and install a hand pump. Our past fund raising endeavors have always resulted in more cost than revenue. We are looking for 31 people to contribute $100.00 each. Will you help these precious ladies? And the children? Click “donate” in the right column. It was a typical ride through the city. There were near misses with taxis, buses, donkeys and people. A cacophony of sounds (and sights) assailed our senses as the driver maneuvered th e ancient, overloaded Toyota mini van taxi through the chaos that is the streets of Addis Ababa Ethiopia. He missed the final turn. I informed him, he backed down the street against oncoming traffic and miraculously was able to carry us to our destination unscathed. We had arrived at Agohelma Orphanage where four years ago we loaded then eight years old Fetlework into a thirty year old little blue and white taxi and whisked her away to another world. I was honored to accompany daughter Rebecca and her husband Vernon for that experience. 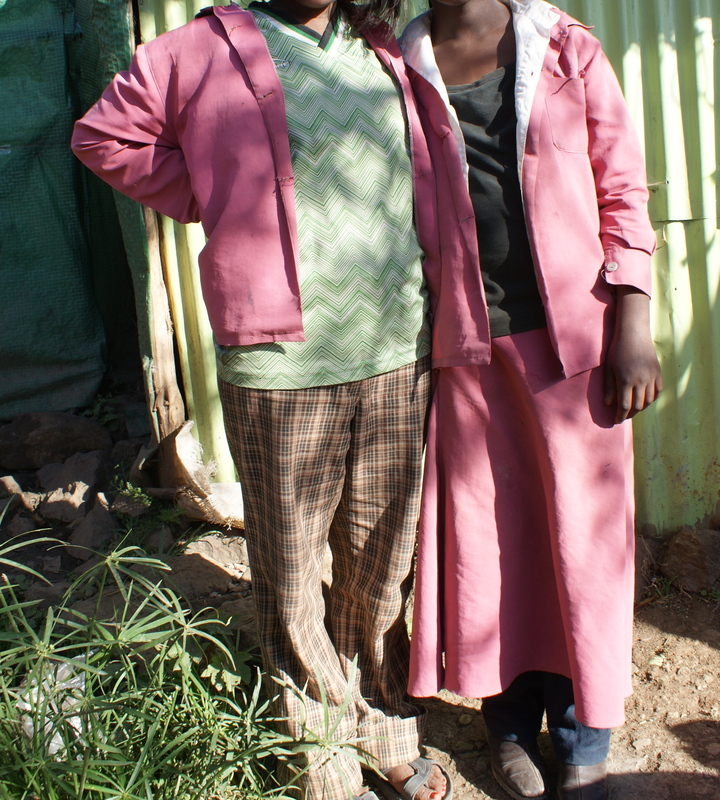 Now we had returned in the process of the adoption of two more Ethiopian orphans. Fetlework and Yonatan, both deaf, joined Mom and Dad to reunite with biological siblings and visit other memorable locations. They were a group of from a Lutheran ministry in Sweden visiting locations where they sponsored children and had just looked at photos of Fetlework on the wall from when she was a small child. A few minutes after they exited the room there was Fetlework walking toward them. Hugs, kisses, introductions, photos, more photos and it was time to go. The journey began at 5:30 A.M. in Addis Ababa Ethiopia. The taxi arrived and I got in. Daylight was yet to arrive in the capitol city and the streets were nearly deserted. Daniel, my interpreter for the day introduced me to the driver and seventeen year old Zerihun who I had not previously met and whose home in a remote village we were going to visit. He and his brothers have lived alone since their parents died seven years before. They are siblings of an adopted deaf sister who now lives in USA. We drove through the Merkato, purported to be the largest open market in Africa. The darkness was palpable. It was an eerie feeling to see the paper and trash littered street empty except for a stray dog scavenging and trucks parked along the side. At the bus “station” it was different. Hordes of people were milling about, some shouting above the din of diesel engines which were belching the exhaust smoke that created an enveloping cloud. We were placed on one bus, then another. I could not understand what was happening but interpreter Daniel did his job well and finally the last bus we boarded lurched onto the street and began to climb out of the valley into the emerging light. Thankfully it was going in the right direction. Two and a half hours of driving along the twisting turning mountain road we arrived at the village Debre Tsigie and went into a dingy little restaurant where Zerihun and Daniel ate breakfast. I would not eat in that place! Our trek to the village began downhill on a lava rock strewn road that soon became a track and then, before we reached the valley floor, disappeared. For an hour and a half we walked. We skirted fields of wheat, beans and maize (corn). At times the terrain was marshy and our shoes sank into the muck. Half way across the valley was a big two lane concrete bridge. No road, just a bridge complete with concrete rails. I could see a person in the distance who was wearing a red coat watching us. He began to draw near and soon was following a few steps behind as we traversed the valley and climbed the steep slope towards our destination, a series of low stone walled compounds at the top of a hill. He was a boy, perhaps ten years old, a silent companion who chewed on a broken twig and smiled a shy friendly smile. The house was a square mud hut with a tall thatched, conical roof, called a tukul. The walls had been recently re-covered with a coat of fresh mud, cow dung and straw veneer inside and out. There was a wooden door which could be locked but no windows. The interior was cool and dark and the floor was earth, swept clean, and bumpy from protruding rocks. A fresh pile of sleeping straw was stacked in one corner and in another, perched on the low rock foundation, was a wooden box that had a closed, hinged top. A few bottles and personal items sat along the ledge and in another corner, near the door, were bags of grain and a round, broken injera basket. Zerihun brought out some animal skins, spread them on the ledge and there we sat and talked. As politely as I could I refused a drink of milk and explained: “I have been sick” which was true. Sometimes it is a bit of an adventure to eat the local food. There is another “house” where cooking is done and a smaller one made only of poles placed vertically, spaced close together to protect the domestic animals from the hyenas. I presented gifts for Zerihun and Dogachow, his twelve year old brother and Wondeson, fifteen, who was in a distant part of the country “following the harvest.” He works with a sickle, squatted down. 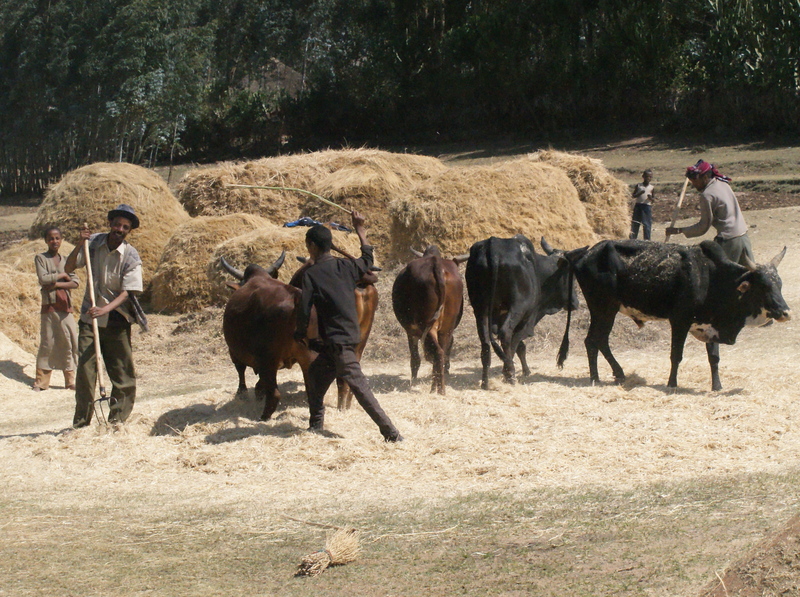 The crop is cut by hand, dried, and threshed by walking animals round and round to separate the grain, beans or peas from the hulls, after which it is tossed into the air for the wind to blow away the chaff. I met some neighbors though we could not converse, photographed the local children, the house and the animals. Too soon we needed to leave. The buses wouldn’t wait. We walked another hour and a half back to the village and located a bus which was traveling in the right direction, sat inside and said our goodbyes to Zerihun. When he turned to leave he was stifling back tears. He has been head of household since age ten. We were his first non resident visitors and I was the first farangi to have ever been there . God Bless whoever has helped them.